Fleep has a customized webhook for GitLab to post updates into Fleep conversations about the changes in your GitLab repo. Create the conversation where you want to receive your GitLab updates. In that conversation open Conversation Settings > Integrations and click on the Add button and then Create on the next popup window to generate a new hook for GitLab integration. Copy the hook URL from the Active integrations list that opens up in Fleep. Log into GitLab and select the project for which you wish to get updates. Select Settings - Inegrations from the project dashboard. 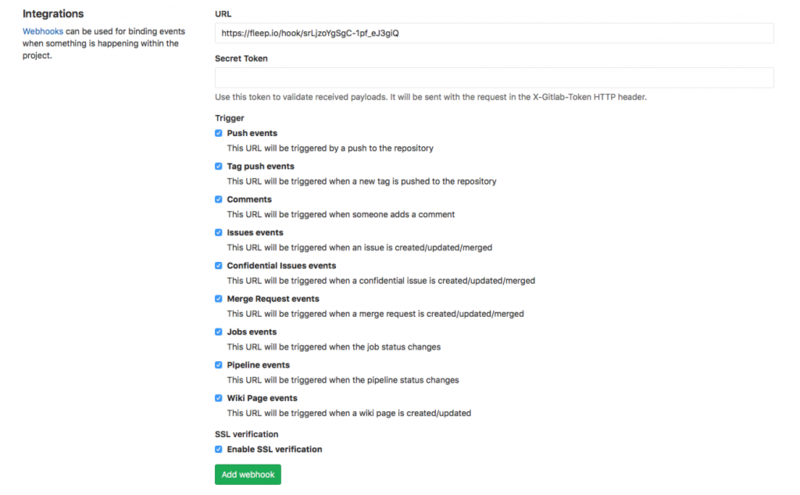 On the Integrations page insert the hook URL you created in Fleep into the URL entry field, select the events you wish to be notified about in Fleep and click Add webhook. BOOM! You’re done! We can already see the bits of information finding their way into your conversation!